Nous serons fermés du 14 janvier au 1er avril 2019. Vous pouvez toujours nous envoyer vos commandes par courriel pendant cette période, et nous vous répondrons rapidement à notre retour. Merci de votre patience durant cette retraite. L'envoi de la commande finale aura lieu le 14 janvier. Dans ce cas, les commandes doivent être confirmées et payées avant l'envoi. and we will respond quickly upon our return. Thanks for your patience during this retreat. Final order mailing will be on January 14. In this case, orders have to be confirmed and paid prior to mailing. We have some wonderful new resources, showing below here. Nous avons quelques nouvelles ressources merveilleux, ci-dessous. SVP renseigner par courriel pour les prix actuels, car nous ne mettons pas à jour les prix sur ce site. Si vous ne voyez pas ce que vous cherchez sur notre site, SVP nous envoyer un courriel. Il est possible que ce soit ici, en stock, mais simplement que nous n'avons pas l'énuméré ici, encore. If you don't see what you are looking for on our website, please email us. We may simply not have listed it yet! Due to fluctuations in the exchange rate between Canadian/US currencies the prices listed on this website are not kept current. We will be happy to provide updated prices anytime you contact us. Please simply email or phone for a quote. En raison des fluctuations du taux de change entre les devises canadiennes et américaines,les prix indiqués sur ce site ne sont pas tenus à jour. Nous serons heureux de vous fournir des prix mis à jour chaque fois que vous nous contactiez. SVP simplement nous envoyez un courriel ou par téléphone pour un devis. You may phone 613-267-3973 any day between these times, Eastern time zone. Please speak slowly and clearly if you leave a message, and we will be happy to return your call. Please email info@sourcevipassana.ca and we will try to answer within 24 hours and hopefully sooner! Mail outs are Monday through Friday. Keep scrolling down below here for other items of interest and special offers, etc. tous les jours, heure de l'Est. Parlez lentement et clairement si vous laissez un message. Nous serons heureux de retourner votre appel. SVP, écrivez à info@sourcevipassana.ca et nous allons essayer de répondre dans les 24 heures. Les envois sont effectués les jours de semaine. Clé USB pré-chargée avec les ressources précieuses suivantes - et les discours du soir des cours du 10 jours sont disponibles en anglais et en français. Audio discourses from the 10-day course. Si vous le demandez, les discours en français peuvent être inclus. (note: English is already included). The path of the monk is high and lofty. It is said that the path for the monk is clear and smooth and easy to walk on. It is high above the muck and mire. There are no stones, pebbles, sharp rocks or thorns. Unfortunately for us poor householders this is not the case. Our lives are bound up in worldly responsibilities, jobs, family ties, and mortgage payments. Unlike the monks, our path is full of worldly impediments and distractions. It is for this reason that I think A Meditator’s Handbook might help Vipassana students on their walk along this path of purification. This collection of talks by internationally known Buddhist scholars presents complex Buddhist insights into living life guided by the Noble Eightfold Path, and how to live more freely through it. Set in the context of Sri Lankan culture,topics include: Psychological well-being, The basis for ethical living, Discerning meaning in this life, The centrality of meditation, The monastic experience in Sri Lanka, a way to respond constructively to our global human foibles,Explanations of ancient religious practices still current today.Engaged discussions with American students and question-and-answer sessions are included. This address delivered by S.N. Goenka was delivered at the United Nations in 2002. The Buddha taught of the possibility of a true freedom as something inherent in human nature. For followers of the Buddha's teaching, the ultimate freedom is to achieve full release from the root causes of all suffering: greed, hatred and delusion, which clearly are also the root causes of all social evils, harmful to others. To weaken, and finally eliminate them in oneself, and, as far as possible, in society, is the basis of Buddhist ethics. And here Buddhist social action has its place. This book of essay's topics include, among many others, the background of early Buddhism; the significance of the Buddha's birthday; the Buddhist doctrines of karma and reincarnation; the Buddhist conception of truth, good and evil, Nirvana, the individual, the universe and the material world; the Buddhist view of nature and destiny; Buddhism and the caste system; Buddhism and international law; and the contemporary relevance of the Buddha's teachings to the modern world. The Bodhisattva Ideal: 6 essays on the origin and history of the emergence of the Mahāyana, from various perspectives including scholarly examinations of the terms in the Nikayas and Agamas, to the relationship of the bodhisattva and the arahant ideals. Godwin Samararatne who was a lay meditation teacher renowned for his gentle, compassionate and skillful way of teaching meditation. Godwin's approach to meditation was very practical and he explained it in common, everyday terms accessible to ordinary people. This book is an abridged version of the author's The Path of Serenity and Insight: An Explanation of the Buddhist Jhānas. In simple, accessible language, the character of the jhanas, and instructions for their attainment, are laid out. Cette traduction publiée aux éditions du Seuil des trois discours donnés par Goenkaji en Birmanie en 1991.
de textes de Goenkaji auprès du grand public. Ce livre est disponible ici maintenant. It is the view of these experienced therapist/authors that a full cure, recovery and healing from addictions is possible if the addicts learn how to reorganize and restructure their own habitual ways of perception and cognition. Vipassana meditation serves as the instrument of choice to realize this transformation. 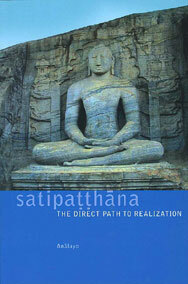 Publisher: Vipassana Research Publications, $ 18.00. Available now.